U.S. Patio Systems and Home Remodeling is an authorized dealer of TEMO pergolas and proudly offers pergola installation services throughout Minneapolis, MN, and across the entire Twin Cities region. The reason why we sell TEMO pergolas instead of pergolas from any other manufacturer is because TEMO is a backyard shade structure specialist that originally developed many of the engineering features that are now standard in the outdoor living industry. A TEMO pergola is a meticulously designed and painstakingly crafted shade structure that marries aesthetic charm with modern materials and state-of-the art construction practices. By having a TEMO pergola installed in your backyard anywhere in the Minneapolis area, you will be creating a partially shaded designated sitting area that is the ideal spot for entertaining, relaxing, and spending quality time with family. Unlike ordinary wood pergolas, every TEMO pergola features heavy-duty aluminum construction and an electrostatic paint finish for a long-lasting beautiful appearance and resistance against cracking, rotting, warping, and insect infestation. Plus, special snap-fit assembly completely eliminates the need for screws, nails, and all other types of fasteners, which otherwise would detract from the pergola’s elegant appearance. None of which is to say that all TEMO pergolas look alike. The TEMO pergola that you buy from U.S. Patio Systems and Home Remodeling will be a made-to-order structure that can either be free-standing or attachable to your house. Available column designs include Roma, Florentine, and Venetian, each one an eye-catching style reminiscent of old-world Italian architecture. For more information, please contact U.S. Patio Systems and Home Remodeling today. 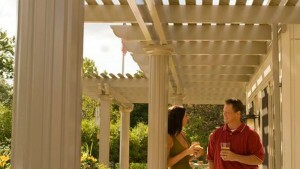 We proudly offer TEMO pergola installation throughout Minneapolis, MN, and the Twin Cities region.